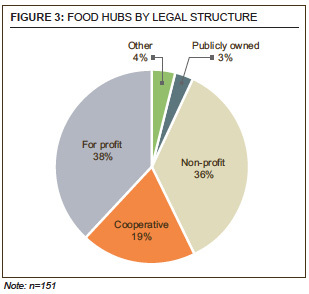 Food hubs—businesses that actively manage the aggregation and distribution of source-identified food products—are receiving continued, growing attention from diverse stakeholders who see food hubs as vectors for economic growth and social and environmental change. As consumer desire for local and regional foods continues to grow and evolve, food hubs are increasing in number and adapting to shifting demand from intermediated local and regional food markets. 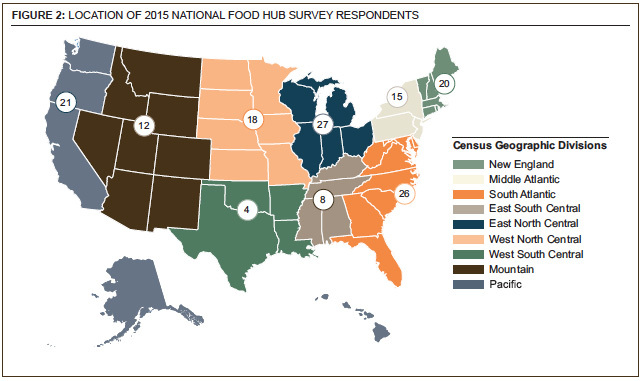 The 2015 National Food Hub Survey and its predecessor, the 2013 National Food Hub Survey, represent a broad effort to aggregate national-level data on the characteristics and impact of food hubs. Together, these surveys represent the beginning of a longitudinal database from a large, broad national sample of food hubs. The 2015 survey findings came from 143 hubs around the country and indicate that as new food hubs continue to open for business, more established food hubs continue to operate and thrive. One-third of hubs completing the survey began operations in the last two years. Three-fourths of surveyed hubs across the nation are breaking even or better. 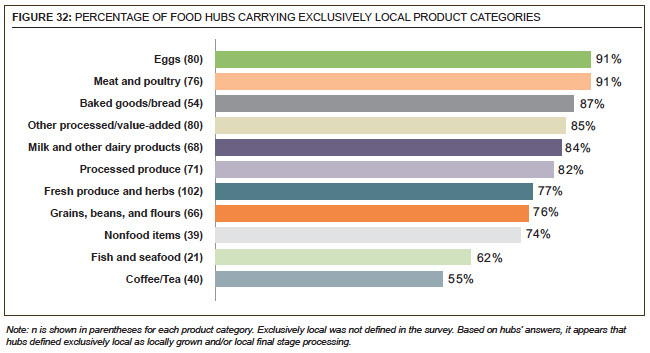 By comparison, a little over two-thirds (68%) of food hubs were breaking even or better in 2013. 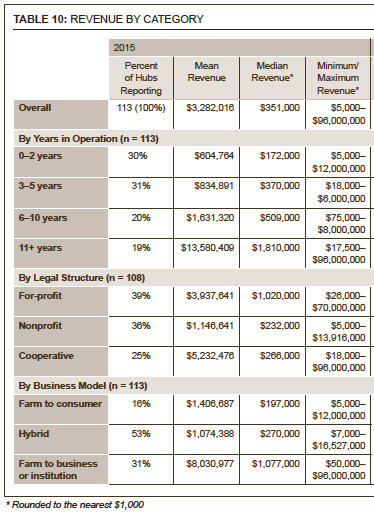 We think this change represents an important threshold that demonstrates the food hub model can be financially successful across a variety of legal structures and geographic or customer markets. Our findings suggest that financial success coexists with mission-related success. 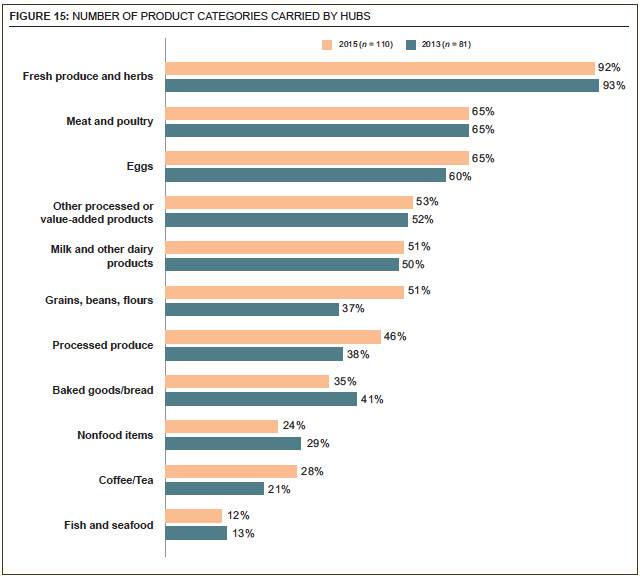 • Food hub suppliers and customers are almost entirely regional. More than 9 out of 10 food hub farm or ranch suppliers are located within 400 miles of the hub, and 3 out of 4 food hub customers are located within 400 miles of the hub. • Food hubs are good for small and medium agricultural operations. 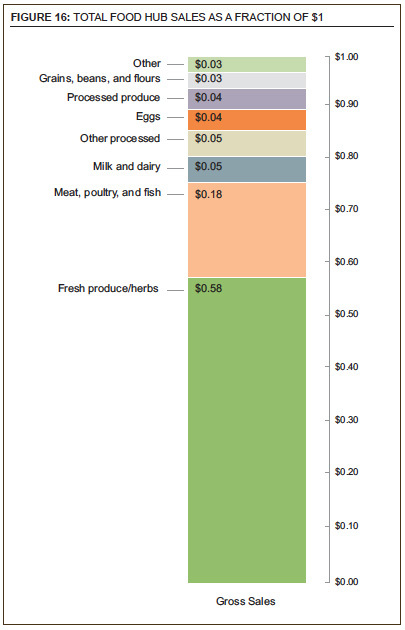 More than 9 out of 10 food hubs source exclusively or mostly from farms and ranches with gross sales less than $500,000. 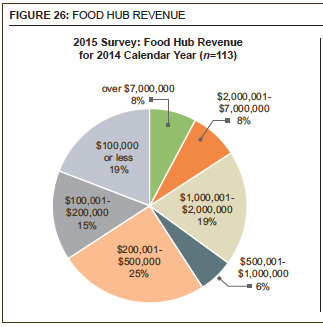 Food hubs have, on average, nearly 80 farmer and food business suppliers. 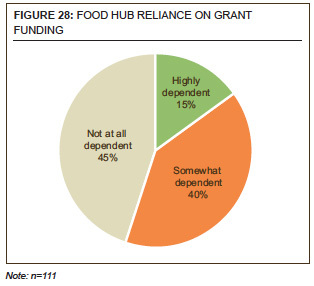 • Food hubs strive to increase community food access and improve health outcomes. More than 87% of food hubs work to increase access to healthy or fresh food as part of their daily operations and programs. More than 95% of food hubs work to improve human health in their communities or region as part of daily operations and programs. 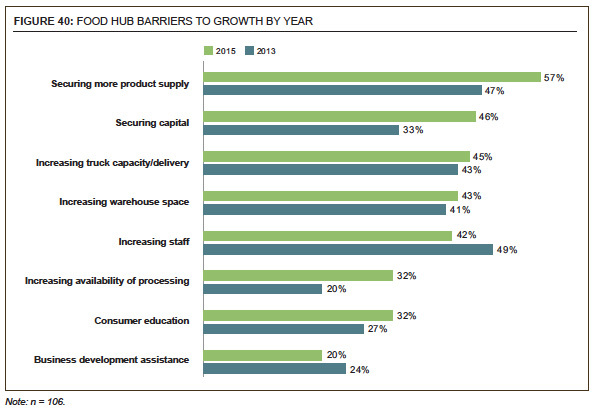 Almost all food hubs expect that business will continue to grow, but not without challenges. • Food hubs are addressing challenges that include compliance with the Food Safety and Modernization Act (FSMA). Forty-six percent of hubs already require producers to show proof of food safety regulation compliance. The percentage of hubs requiring Good Agricultural Practices (GAP) certification increased 8% since 2013, and fully two-thirds of hubs either prefer or require GAP certification. • Food hubs turn to communities of practice and networks for information. Almost half of hubs rely on informal networks and/or formal networks and communities of practice to learn and share business ideas. Formal communities of practice are the most highly ranked information source. • Food hubs are concerned about maintaining product supply and keeping up with business growth. Securing more supply is a concern for more than half of surveyed hubs; however, less than half of those concerned think they can address this problem within the next year. Managing growth can perhaps be seen as a desirable problem to have. Yet without adequate capital and delivery, staff, and warehouse capacity, each of which was mentioned as a barrier by at least 40% of hubs, growth can quickly become a liability.